Your attitudes and beliefs (values) drive both your own behaviour and your response when you see your workers taking risks. How you behave in response to health and safety risks sends a powerful message to your workforce about how seriously they should treat the risks. If they see you taking risks, then your workers also will, leading to potential accidents/ill-health. Your values about health and safety and behaviours that lead from these set the tone for your business’s overall health and safety performance. It is your values that ultimately define your business’s health and safety culture! The root causes of accidents, incidents or ill-health can usually be traced back to leaders, not workers, decisions and behaviours. How well you resource and plan for health and safety impacts whether your project is delivered to cost, time and good health and safety standards. Supervisors are role models too and drive team standards. Supervisors’ attitudes shape their team’s attitudes. This makes it possible for different teams working on the same site to have different health and safety standards. How well your supervisor communicates and engages with their team will influence their team’s commitment to health and safety and to your business. 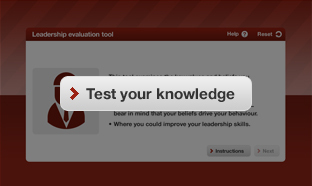 Use the Health and Safety Leadership Check Tool to learn more about your own leadership approach. 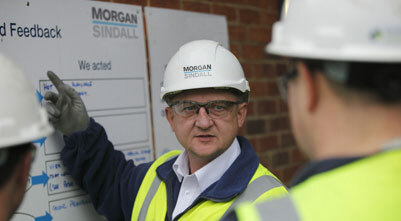 This will give you some tips on how to improve the way you lead health and safety on site. But, only if you answer the questions honestly! If you do not have the capability to use Flash please use the text version. Here are more tools and techniques on how to improve health and safety leadership on site for you and your fellow managers and supervisors. The information sheet on ‘Good Health and Safety Leadership’ describes what makes a good leader and provides tips on how to effectively lead health and safety on site. Good Health and Safety Leadership. This information sheet on ‘Effective Communications for Toolbox Talks, Safety Briefings and Inductions’ will help any manager or supervisor who delivers toolbox talks, safety briefings and/or inductions. It gives hints on how to be an effective communicator and presenter. Effective Communications for Toolbox Talks, Safety Briefings and Inductions. You may also find these Training Packs useful. They are produced by the Health and Safety Laboratory and are designed for you or your managers/supervisors to run in-house. You may, however, decide to use independent consultants (eg HSL and other external training providers) to run the various types of training. Training Pack 1 is to train your managers or supervisors. This is useful when creating a shared commitment that health and safety is a priority and to improve your company’s health and safety culture. Training Pack 2 is a useful training aid for managers and supervisors who deliver toolbox talks to workers and/or safety briefings. It outlines what these methods set out to achieve and gives advice on what to include and how to deliver these talks. You and your supervisors might also want to view the video Protecting Our Biggest Asset, which demonstrates good principles of communication. Protecting Our Biggest Asset clip was kindly provided by Ryder Marsh (Safety) Ltd from a DVD developed with the British Constructional Steelwork Association (BCSA) Ltd. Without your real commitment to health and safety, accidents, incidents and ill health are likely to occur. Supervisors are role models too; they drive team standards. Even if you are fully committed to health and safety, if your supervisors are not, their attitudes can act as a bottleneck and stop your intentions to improve health and safety from reaching workers. taken an honest look at your own health and safety attitudes and beliefs. have identified what kinds of behaviours show good health and safety leadership and how you can encourage these in yourself and your managers/supervisors. have begun to develop your (and your managers/supervisors) communication skills to improve the quality of your conversations with your workers and how you provide information about on site risks.